Henry’s Run is a 5k run/walk to raise awareness for child abuse prevention. All proceeds will benefit the Child Advocacy Centers of South Dakota and Child’s Voice, to help provide child abuse prevention materials such as “The Period of Purple Crying” to new parents. This is a dvd to educate people on the dangers of shaking a baby. 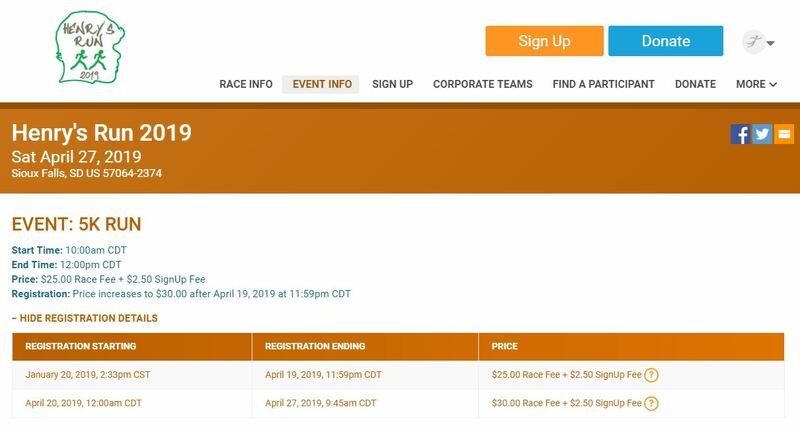 The 5k will start and end at Falls Park in Sioux Falls, SD.First place for Mens and Womens will receive a free night stay at the beautiful Townplace Suites. First place for boys and girls 12 and under will receive $25 dollar gift certificates to Scheels! Come join us rain or shine and help us fight child abuse by raising awareness in our community! PACKET PICK-UP IS APRIL 26TH FROM 10:00AM-6:00PM at Great Outdoor Store, 201 E 10th St, Sioux Falls, SD. Very limited packet pick-up on race day (closes 45 minutes prior to race). Farmers Market Pavilion – north end of Falls Park. A special thank you to our awesome sponsors who chose to fight child abuse and promote this great event and worthy cause! Aflac . Siouxland Child Protection Council. First Premier Bank. Dakota Supply Group. Ophthalmology Ltd. Fareway Food Stores. Sanford Health. Norwex. Dix/Beck Family. Babybel. Scheels. Maximizing Excellence. Freya Interior Design. SoDak Sports. Townplace Suites. The Great Outdoor Store.